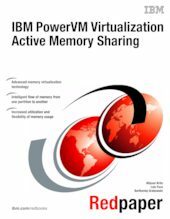 This IBM® Redpaper™ publication introduces PowerVM™ Active Memory™ Sharing on IBM Power Systems™ based on POWER6® and later processor technology. Active Memory Sharing is a virtualization technology that allows multiple partitions to share a pool of physical memory. This is designed to increase system memory utilization, thereby enabling you to realize a cost benefit by reducing the amount of physical memory required. The paper provides an overview of Active Memory Sharing, and then demonstrates, in detail, how the technology works and in what scenarios it can be used. It also contains chapters that describe how to configure, manage and migrate to Active Memory Sharing based on hands-on examples. The paper is targeted to both architects and consultants who need to understand how the technology works to design solutions, and to technical specialists in charge of setting up and managing Active Memory Sharing environments.